Taman Seri Damai, Batu Lanchang, Penang. I really have to stand in the queue from 10.30 pm to wait for the stall to start selling. When asked what time is their biz hours, I was told it starts at 11.00 pm and ends when the food is sell out (it could be 12.30 am after midnight or a little later or it can be 2.30 am). Getting ready to start at 11.00 pm sharp. A big variety to choose from. 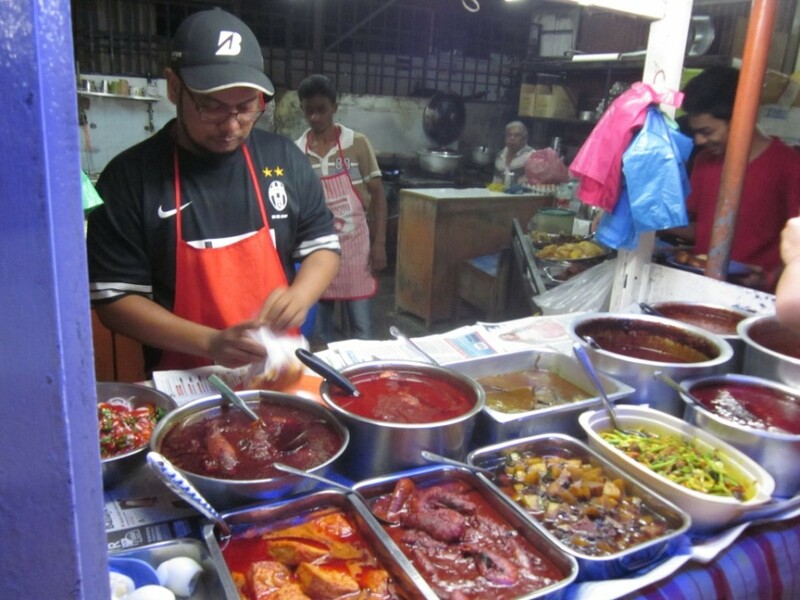 Malaysians are crazy about food and especially Penangites are food obsessed. 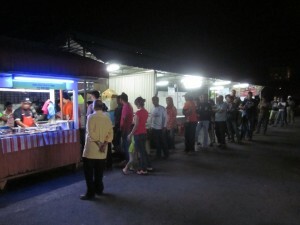 The 2 hours never-ending queue for this nasi tomato and odd hours of biz never stop the local . Is i really worth the wait?? Food is undeniably good. Definately worth it! My trip to Penang is quite a short one but I really wish I have the time to sample all the dishes. I ended my 5000 calories food marathon of the day with this plate of tomato rice with sambal ikan bilis, daging masak kicap, kachang masak kunyit, ayam goreng and tau kau ketchup. 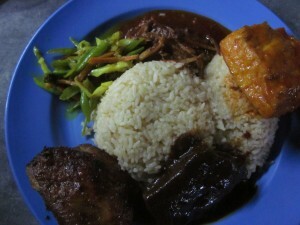 Every dishes, I sampled was excellent….perfect and only cost me RM7.00. The only thing I regretted was I could have ordered for another plate but the queue was already too long for me to go for the second round. But at least I learnt my lesson, the next time I revisit this place. I will make sure I have a plate of tomato rice on both of my hands to avoid the queue for the second round.